Here is an amazing glimpse into the dark side of the force that is Hollywood economics. The actor who played Darth Vader still has not received residuals from the 1983 film "Return of the Jedi" because the movie, which ranks 15th in U.S. box office history, still has no technical profits to distribute. How can a movie that grossed $475 million on a $32 million budget not turn a profit? It comes down to Tinseltown accounting. As Planet Money explained in an interview with Edward Jay Epstein in 2010, studios typically set up a separate "corporation" for each movie they produce. Like any company, it calculates profits by subtracting expenses from revenues. Erase any possible profit, the studio charges this "movie corporation" a big fee that overshadows the film's revenue. For accounting purposes, the movie is a money "loser" and there are no profits to distribute. Confused? Imagine you're running a lemonade stand with your buddy Steve. Your mom says you have to share half your profits with your sister. But you don't wanna! So you pretend your buddy Steve is actually a corporation -- call him Steve, Inc -- charging you rent for the stand, the spoon, etc. "Dang, mom, I don't have any profits, I had to pay it all to Steve, Inc!" you say when you come home. But the money isn't gone. It's as good as yours -- in your best friend's pocket. So: "Return of the Jedi" is a $475 million lemonade stand. Hollywood can't really work like this, you're thinking. But it does. 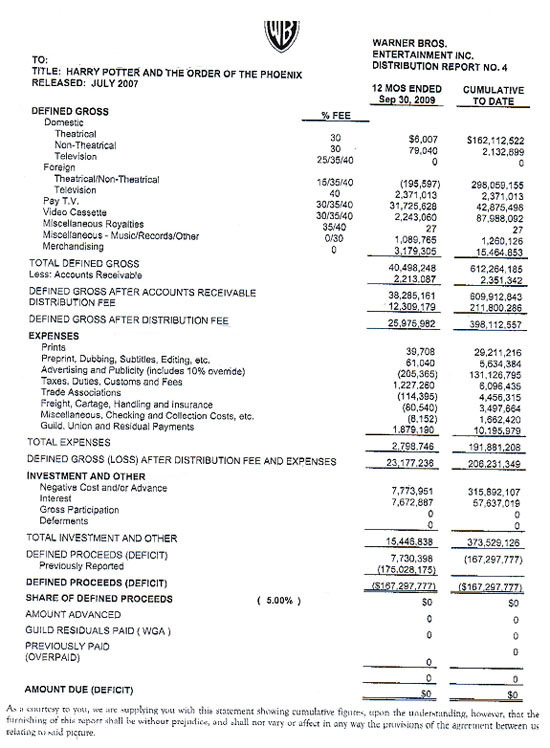 Last year, the website Techdirt revealed a balance sheet from "Harry Potter and the Order of the Phoenix", which, under Hollywood accounting, ended up with a $167 million "loss" even though it's one of the top grossing films of the last decade. Warner Bros. charged about $350 million in distribution, advertising, and interest fees to this external corporation. Here's the receipt. "I get these occasional letters from Lucasfilm saying that we regret to inform you that as Return of the Jedi has never gone into profit, we've got nothing to send you. Now here we're talking about one of the biggest releases of all time," said Prowse. "I don't want to look like I'm bitching about it," he said, "but on the other hand, if there's a pot of gold somewhere that I ought to be having a share of, I would like to see it." Most corporations try to make a profit by limiting costs. Movies corporations manage to record a loss by maximizing costs. Only in Hollywood, indeed.